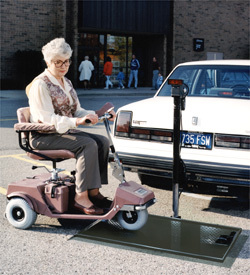 The Mobile-Lift Model 19675 for conventional vehicles offers you the ultimate in quite convenience and independence. 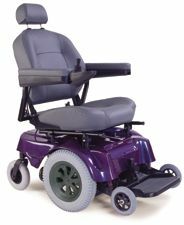 It requires no disassembly of your 3 or 4 wheel electric scooter or power wheelchair. Simply drive the scooter or wheelchair on to the platform, attach the safety harness and push the switch. The Mobile Lift raises and locks any scooter into place on the back of your vehicle in just 60 seconds so you can be on your way. The Mobile Lift can be mounted on your automobile by any local trailer hitch installer. It simply bolts onto a class 3 receiver hitch, and weighs only 62 lbs.! The lift comes complete with simple wiring and installation instructions, owners manual and a one-year warranty. Another great standard feature, the lift folds down for easy access to the cars trunk, the rear of station wagons, vans or pick-up trucks. No expensive swing away option is needed! Lift folds down to allow access to trunks, van hatches and tailgates. Hitch Height 13" to 15"
Simply lower platform to the ground and drive scooter onto platform. Secure scooter with straps, push switch to raise lift and your on your way! Lift folds down for easy access into car trunks, or the rear of vans, stationwagons and pick-up trucks. Fold lift up and secure with strap when lift is not in use.